Adrian Sullivan exploded through the competition today at GP Milwaukee. 1,300 players began the tournament; 250 advanced to Day 2. One man and four dragons now stand alone with the trophy. THE HASHTAG FOR GRAND PRIX MILWAUKEE IS #GPMILWAUKEE. JOIN THE CONVERSATION. This weekend at GP Milwaukee 1,300 players showed up to compete for the title of Standard champion. 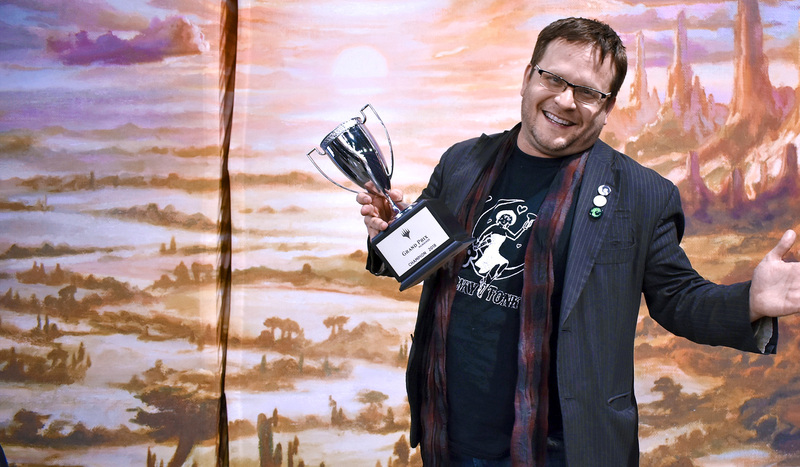 One week after Pro Tour Guilds of Ravnica the state of the metagame was evolving quickly away from the Red-White Aggro that dominated its Top 8. This weekend belonged to Golgari Midrange and Jeskai Control as they battled it out for supremacy. Despite the prevalence of Carnage Tyrant, it was Niv-Mizzet who claimed the title of most feared lizard in Magic, thanks in part to Expansion//Explosion. It was an all-local finals between Madisonian Adrian Sullivan and Minnesotan Brian Lynn. A meeting of Sullivan who has been at events since about as long as the game has been around and Lynn who has just earned his first Pro Tour invite. In the end Sullivan took home the trophy and the Midwest as a whole enjoyed a strong showing. Exactly 1300 players have shown up to battle for the title of Standard champion in Milwaukee. Last week’s Pro Tour Guilds of Ravnica had a wide-open metagame in the swiss rounds of Standard, with all five guilds represented. But, with a Top 8 stacked with Red-White Aggro, it appeared this Standard might revolve around Healer’s Hawk, Ajani’s Pridemate, and History of Benalia.